Significant development is occurring in several downtown districts in the region’s largest cities. Major revitalization is underway in the cities of Scranton, Hazleton, Pittston, Wilkes-Barre and Carbondale, where millions of dollars in private capital have been invested, resulting in thousands of new and planned employment opportunities. Downtown amenities are important in building a knowledge-based economy. Over the past several years, significant attention and priority has been given to entrepreneurial-related projects to help new to market businesses. Strong attention has also been placed on establishing knowledge based, technology-led economic development. This is extremely important from an economic development, youth retention, and image-related perspective. Northeastern Pennsylvania enjoys a diversified economic base. This region continues to be extremely competitive and successful as a location for warehousing and distribution centers, back office call centers, medical and health related office facilities and processing centers, and food processing and distribution. Employment reflects diversification efforts, and is not concentrated in any business sector. Northeastern Pennsylvania’s business base is overwhelmingly dominated by small businesses. According to “County Business Patterns,” a publication by the U.S. Census Bureau, in 2012, there were 22,070 businesses in the region, and 73.4 percent of these businesses employed between 1 and 9 people. The single largest industry sectors by employment are: 1) Health Care and Social Assistance; 2) Retail Trade; and, 3) Manufacturing. Employment in the manufacturing sector is dominated by electronics, fabricated metal products, plastics and rubber products, and food and chemical industries. 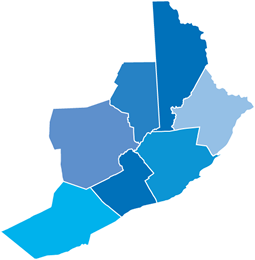 Due to its location by having proximity to major markets, excellent interstate highway connectivity and available land, coupled with an available and trainable labor force, the Northeastern Pennsylvania region (especially the I-81 Corridor) has been able to attract considerable investment from logistics – related businesses. According to 2011 “County Business Patterns” from the U.S. Census Bureau, the region, at 12.8 percent, has a higher percentage of workers employed in the Manufacturing industry as compared to the state and nation with 10.8 percent and 9.7 percent, respectively. Improvements to access roads, which will improve truck traffic flow, have been made to the Humboldt Industrial Parks in Hazleton. The Pocono Mountains provide many recreational activities attracting visitors to our region. According to a 2012 Visitor Report about the Pocono Mountains, from Longwoods Travel USA, there were an estimated 25 million total person-trips that consisting of 9.1 million in overnight trips, and 15.9 million day trips during 2012. Total spending resulting from overnight visits was $1.3 billion and total spending from day visits was $936 million. According to the 2012 Annual Report of the Pocono Mountains Visitors Bureau, meetings generated an estimated economic impact of $6,586,910 within the four-county region. Housing costs within the region are lower than the state and nation. According to the 2011 – 2015 American Community Survey, 3-year estimates from the U.S. Census Bureau, the region has a lower median housing value and median rent than the state and nation. The region’s largest employer is Tobyhanna Army Depot, which is the largest full service electronics maintenance facility in the Department of Defense. The Depot overhauls, repairs, tests, modifies, converts, demilitarizes, and provides technical assembly and installation for airborne and electronic warfare systems, as well as associated equipment for the Joint Warfighter. 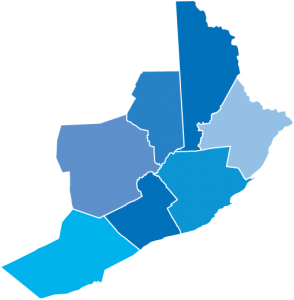 The seven county Northeastern Pennsylvania region includes an area of 4,476 square miles. Its major urban centers are primarily concentrated in the 87 miles stretching from Carbondale in Lackawanna County, through the Wyoming Valley, to Nanticoke, and then following Interstate 81 south to Hazleton and Pottsville. The major cities within this belt are Scranton and Wilkes-Barre. According to the U.S. Census Bureau, the population of Northeastern Pennsylvania in April 2010 was 1,028,926 and in July 2016 the estimated population was 1,007,241. The population has become more diverse. In 2000, the region’s population consisted of 5.9 percent minority, and in 2010, the region’s population had a minority percentage of 13.4 percent. In 2012, the percentage rose to 14.4 percent. This region is home to eighteen (18) colleges and universities offering numerous opportunities for higher education. Curricula are broad, and include many areas of STEM curricula.